Nov. 17 marks the thirty-fifth anniversary of President Richard Nixon's his famous "I am not a crook" line at the height of the Watergate scandal. Flip through TIME's collection of other devastating political quotes. You'll shake your jowls with bemusement. "We still seek no wider war." 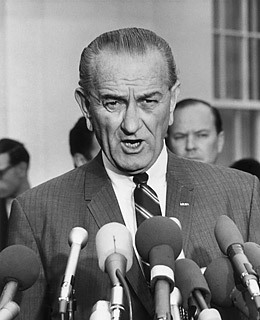 President Johnson announced to the nation after the Gulf of Tonkin incident in August, 1964 that the U.S. would not rise to the bait after what was considered a provocative attack from Hanoi. While the American government claimed that North Vietnamese warships had attacked U.S. vessels in the Gulf, it later turned out to be the opposite. The Vietnam escalation followed shortly thereafter.